"Are you bored of being a valiant prince who saves a lovely princess? Are you sick and tired of dungeons and "mother brain"? [sic] Do you deliberately stay away from games in which you have to fight as a knight in shining armor? 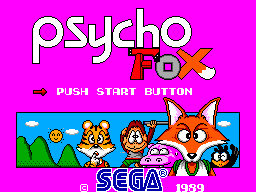 If you've answered "yes" to any of the questions above, Psycho Fox is the game for you! 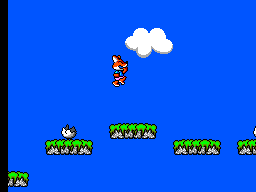 You're Psycho Fox, an extraordinary fox that goes out to save the world from the wicked Madfox Daimyojin. He's the powerful, evil fox that sends out all sorts of bizarre creatures to conquer the world. Ever heard of Zizo Zizo or Poota? They're just a few of the numerous unheard-of enemies you'll encounter. Watch out for those trick stairways and disappearing bridges! The Madfox has completely changed the landscape - just to give you a hard time! Sounds like a tough trek? Don't give up yet! You have the power to transform into other animals to help you get through certain obstacles. Remember, you're not an average fox, you're Psycho Fox!" 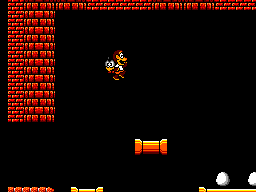 Level maps (by Rouken) in .ZIP format. 672kb in size.